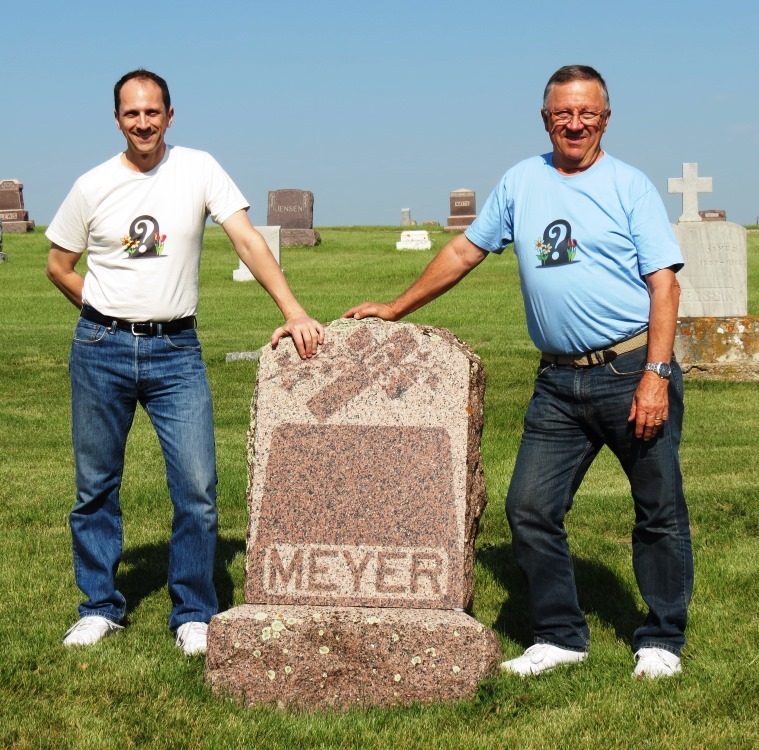 Dad and I visited the memorial of his great-grandparents Meyer, 7/08/15. I bought our "Find a Grave" T-shirts for the occasion. Dad’s mom was Loretta Meyer-Fagerland. I knew her very well, and I remember her mother, my great grandmother Lottie Wiltse-Meyer. For more background about this year’s genealogical adventure through the Plains States, read this post. If you’re already familiar with the trip and would like to read more about what I saw and learned about the Meyer branch, read on! Grandma was the first Meyer ancestor born in North Dakota. Her parents were both brought to ND as children right around 1903. Her dad’s family, the Meyers, came from Wisconsin. Her mother’s side of the family, the Wiltses, came from Iowa. 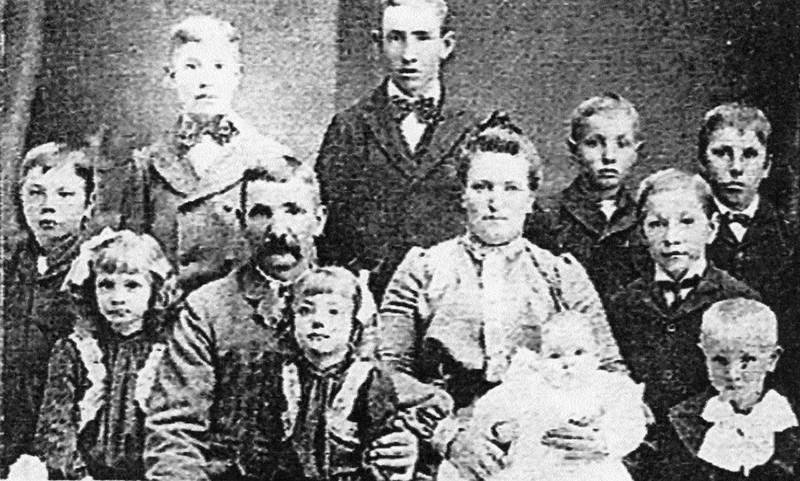 Besides Meyer and Wiltse, other surnames in this branch of the family include Ackerman and Bartlett. Between those two cemeteries was a very interesting relic. According to my late great-uncle Wayne Meyer, my 3GGF Case Wiltse had built a church in Deering, ND around 1900. I knew that Case was a carpenter and an unordained Methodist minister who died in 1904, but I had no idea why he’d have any business in Deering. Without any further clues, Dad and I stopped in Deering to see what we could find. We asked locals about the churches. A town elder named Melvin remembered seeing Case Wiltse’s name in a church that is now boarded up. 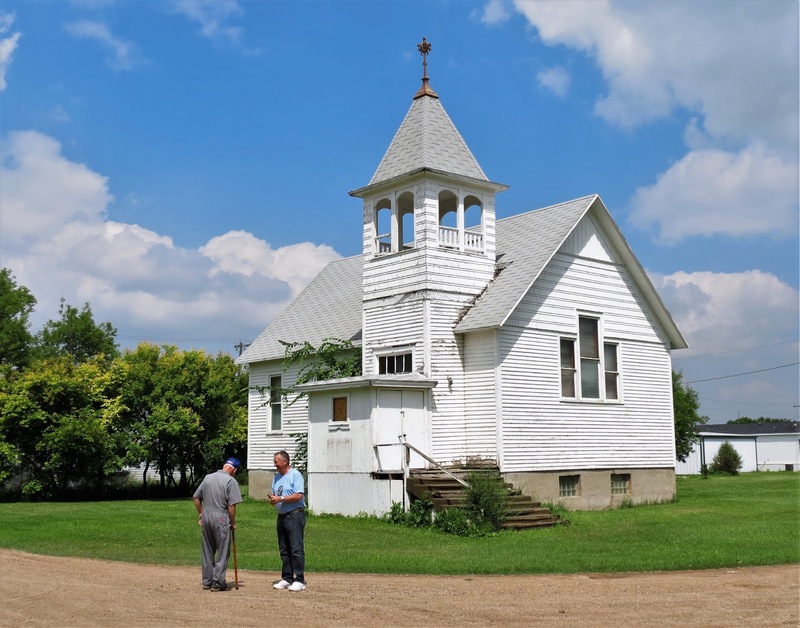 When we met Melvin, he even confirmed that it had once been a Methodist church. With all this circumstantial evidence, it seems that Case really did build a church, and we had found it! I don’t suppose he built it single-handedly, especially at the end of his life. 3GGF Case Wiltse's church, and local oldster Melvin, who showed us to it. 2GGM Meyer was born Anna Ackerman. Her parents are both buried in Minnesota, where they spent their last few years with children (they’d spent most of their life in Wisconsin). Both of them have known cemeteries but missing graves. 3GGF Ackerman is at St. Gertrude Church in Forest City. He is buried in an old part of the cemetery that has been overgrown by woods. 3GGM is at St. Joseph’s Church in Pierz, and was apparently buried with a wooden cross that is gone now. Both of their churches are still standing. St. Joseph’s Church is especially impressive. It’s on the National Registry of Historic Places. I was surprised to find the doors open and candles lit inside. I had the whole church to myself for 15 minutes. I spent the afternoon of July 14 with distant cousin Diana Ackerman-Smith, who’s also descended from my 3GGPs Ackerman. She had information showing that the Ackerman family was in the logging industry. Diana doesn’t know of any pictures of our common ancestors, but she had this incredible picture of my 2GGPs Meyer and their family. My 2GGPs Meyer, whose grave is shown at the top of this blog post. My GGF Peter Jr. is the boy on the left. Diana also provided me with handwritten family tree notes, identifying about ten ancestors I’d never known before. The oldest generation, my 8GGPs, had surnames Bertimus, Scheins, Schlag, and Neuendorf. They lived in the Rhineland-Palatinate, present-day Germany, in 1700. When my 2GGPs Wiltse moved to ND, their parents stayed behind in Kossuth County, IA, where they died and are buried. 2GGM Wiltse was born Abbie Bartlett. Her father, 3GGF Bartlett, was a Civil War veteran; his gravestone is decorated with a badge marked G.A.R. for Grand Army of the Republic. From pretty reliable genealogical evidence that I have seen, this is the same Bartlett family as Josiah Bartlett, a prominent founding father of the United States! As some generations of this family are missing from my family tree, I don’t know exactly how we are related to Josiah. We’re probably distant cousins, but there’s a slim chance we could be descended from him. In Rapid City, Dad and I visited the new Independence Hall museum. 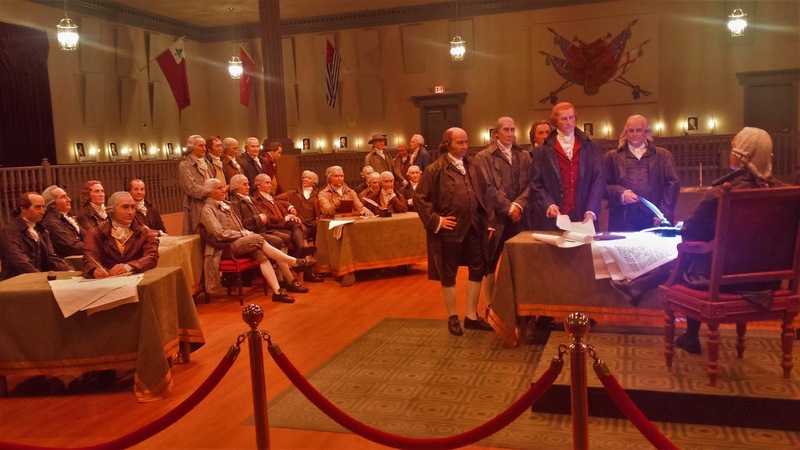 It is a wax-figure reconstruction of the famous painting Declaration of Independence, which shows the members of the 2nd Continental Congress who signed the Declaration. Josiah Bartlett, one of those representatives, is portrayed in that painting and in the museum. The signers of the Declaration of Independence included probable-distant-cousin Josiah Bartlett, 3rd from left. As you can see, genealogy is more than just recording names. It shows how your family was shaped by history, and sometimes how history was shaped by your family!